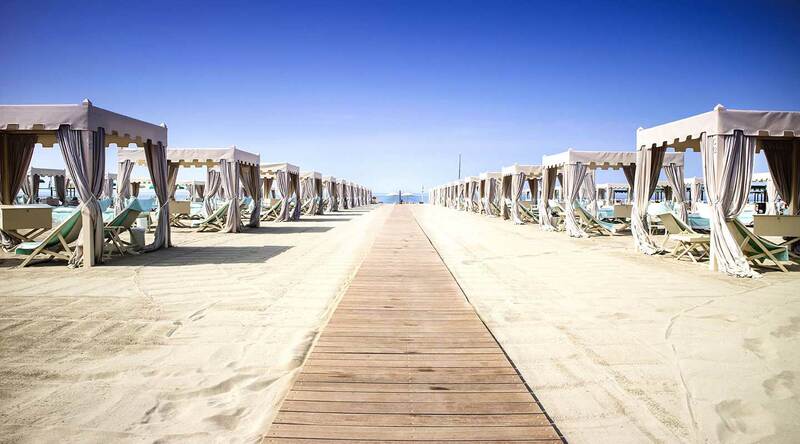 Arianna Hotel is located in Marina di Pietrasanta, in Versilia, very close to Forte dei Marmi. The Hotel strengths are undoubtedly the familiarity and professionalism that characterize it, as well innovative aesthetics of the structure. Arianna Hotel has a convenient location, thanks to the presence of the sea within walking distance and the famous park "La Versiliana", famous for the poetry of D’Annunzio "La pioggia nel Pineto (The rain in the pine)", directly behind the hotel. Here, you can enjoy relaxing walks or visit the open-air theater that lies within. Arianna Hotel is the best choice for any holiday or client: for those who want to relax on the beach as well as for those who love the nightlife, thanks to the nearby presence of locals as "The Shed" or "Seven Apples", the open all night bar as well as the bustling "Twiga Beach Club". Morevover, free bike rental is available at the Arianna hotel. Open for dinner, Hotel Arianna’s restaurant prepares excellent fish dishes and not for those who like the convenience of a half board. Sea, fun and social life, but also evening walks and relaxation with the family. Versilia is all this and has always been a popular tourist destination for summer holidays.